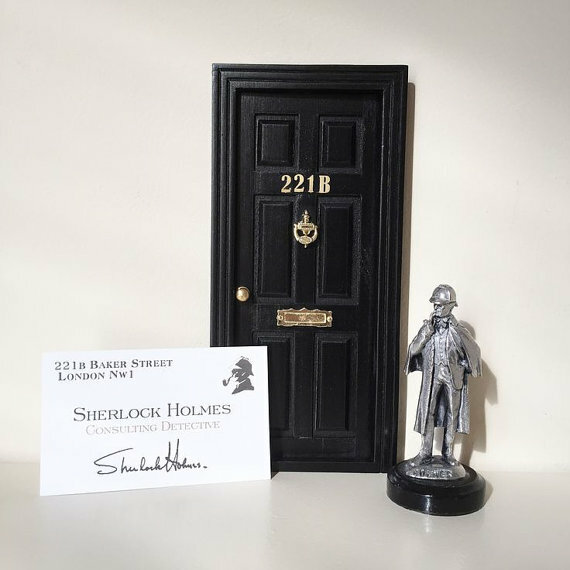 This week I have been so inspired by Vicky Delany's Sherlock Themed mystery series that I thought I would share some recent Etsy Favorites with you starting with this one from VictoriaMaeDesigns. This is a fun set as you can pick an assortment with great sayings and a package of 8/ 16/ or 24! Click here for shop and listing. I love candles and this was a fun inspired candle I found in the In The Wick of Time Etsy shop. It was really the label that grabbed me and then the scent itself, Black tea, fireplace smoke, mahogany, and pipe tobacco. 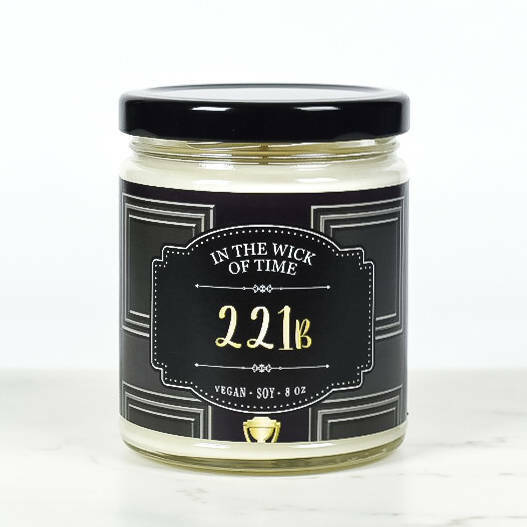 Click here to learn more about this candle and very fun shop. 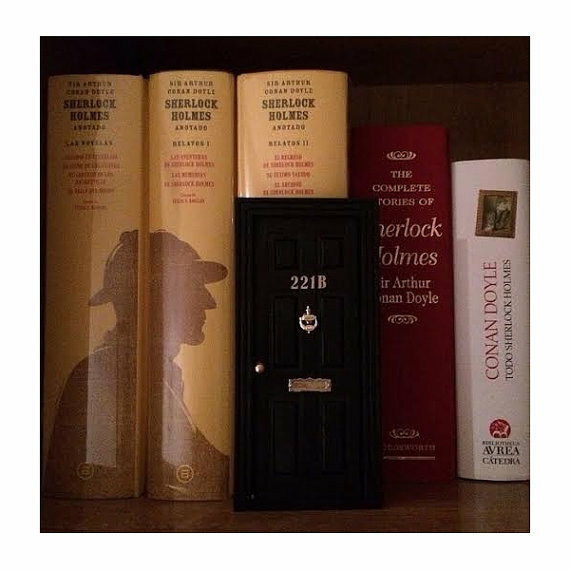 Look how cute this would be on your bookshelf! 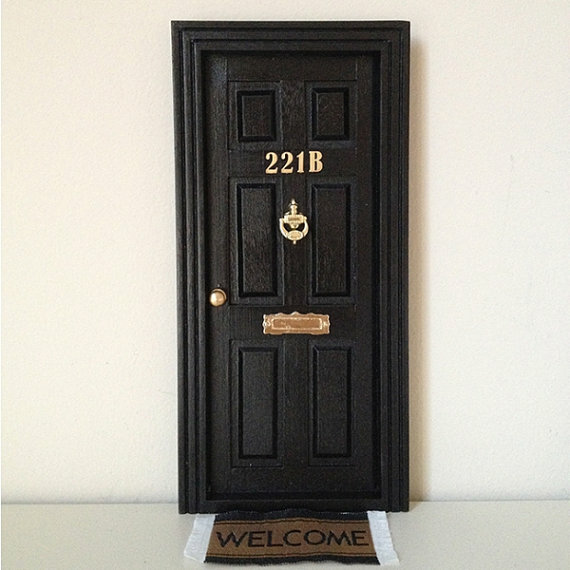 Click here for the toothfairydoors Etsy Shop. 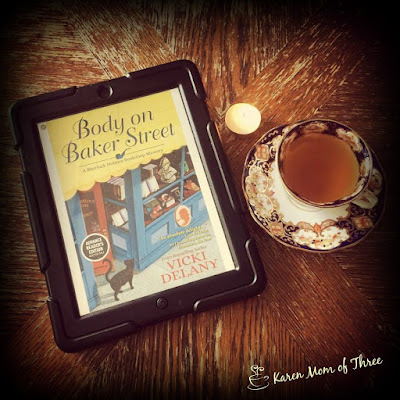 I stayed up really late on Monday night to finish reading Body on Baker Street by Vicki Delany. I think this series is fantastic. 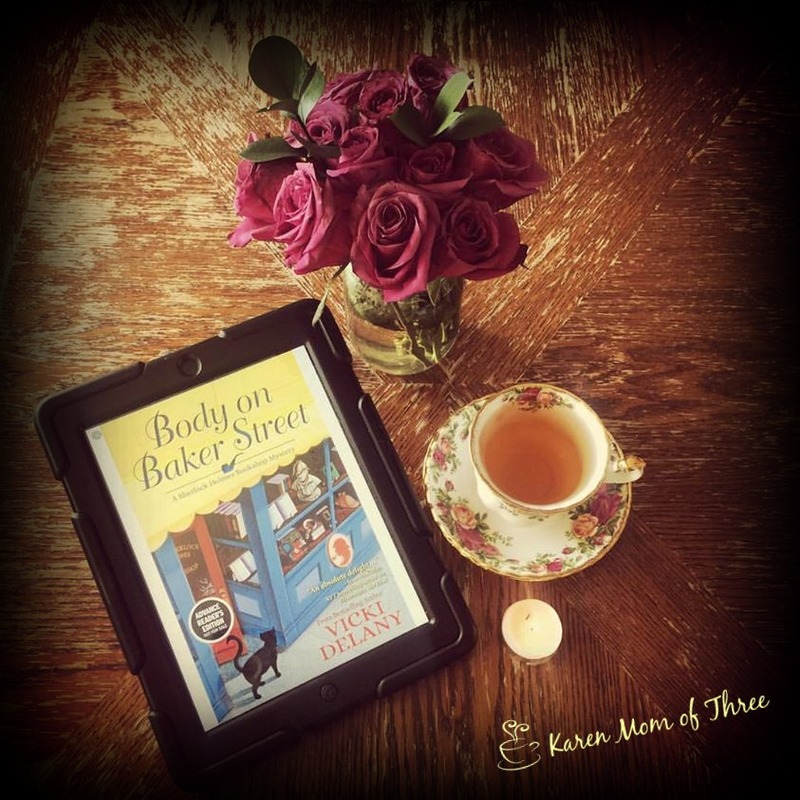 Book two and I really enjoy this Sherlock style cozy mystery. 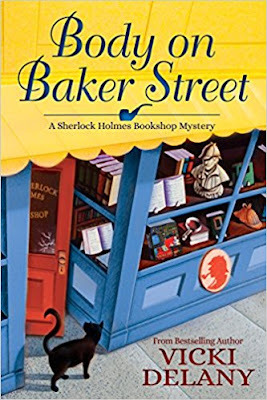 Main character Gemma is even more on point in book two, with her trusty best friend Jayne and a whole heap of trouble in her "small book shop" is visited by a mega author in Body on Baker Street. As much as I enjoyed this mystery and story I was equally intrigued by Jaynes tea shop and menu, I had the worst craving for cream tea at 11 pm! This book was a delight to read and felt quite indulgent to stay up late to finish it! This is a great summer read and will be out at the beginning of September for you to enjoy! You can pre order Body On Baker Street by Vicki Delany from Amazon by clicking here. Find out more about this series and all the wonderful works of author Vicki Delany on her website by clicking here. Sunday night I read Even Witches Get The Blues by J.D. Winters and Dakota Kahn. This is a first in series that is a bit difficult to understand at first but once I realized more about the story it became much easier and quite interesting. This is unlike any witch story I have read before and I found that with each chapter I could not wait to learn more. This book is one I came to know about from something shared on Facebook and I am glad I downloaded it and read it. I think it will be a fun series for sure. 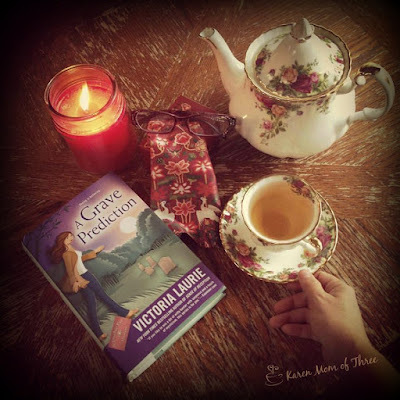 I love paranormal cozies and this one was quite a light read, but a cozy for sure. 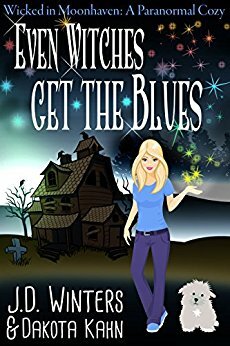 Everyone remembers Haley Greco, except for Haley herself.Haley is a witch with amnesia and she might be the most normal thing in the spooky town of Moonhaven.She wakes up in a strange motel room, no idea who she is, with just the clothes on her back and, weirdly, the deed to a property in Moonhaven where everybody seems to know her. Back for less than a day she discovers, in no short order, that she has an entire missing family, a town history as a wild child, and a grandmother who seems to want her to prepare to save civilization. Not only that, she's the lead suspect in a murder and Deputy Sheriff Shane McAllister knows more about her than he should. The real murderer is on the move. Can Haley clear her name and regain her memory before it's too late? This book is free on amazon.com at time of publishing this review. Click here for the Amazon listing. When I finally got to the jam section I had to do something I do not often do which is I put my ipad down went to the computer and PRE ORDERED A COPY OF THIS BOOK. I knew then and there this was a book I had to hold in my hands and have on my shelf, coffee table and kitchen. I can not wait to make Strawberry and Meyer Lemon Preserves, Peach and Tea Preserves and Spiced Plum Preseves....Vanilla Marmalade, yes that is a thing I need too! but wait still 4 more sections of this book to go...page after page of mouth watering and easily assembled joy! Sweet spreads, nut butters, savory spreads and condiments, pickles and more. I have pre ordered my own book from The Book Depository with free shipping world wide (as I live in Canada this is my prefered method of ordering books) and now I anxiously await it's arrival. You can find yours by clicking here from The Book Depository. Rustic breads, scones, and biscuits paired with fruit-jams, jellies, nut butters, savory spreads, pickles, and more--from the James Beard award-winning author of Sourdough. Bread and butter, toast and jam, scones and clotted cream--baked goods have a long tradition of being paired with spreads to make their flavors and textures sing. As a baker with a passion for plants, Sarah Owens, author of the James Beard award-winning Sourdough, takes these simple pairings in fresh new directions. Spread some Strawberry & Meyer Lemon Preserves on a piece of Buckwheat Milk Bread for a special springtime treat. Top a slice of Pain de Mie with Watermelon Jelly for a bright taste of summer. Lather some Gingered Sweet Potato Butter on a piece of Spiced Carrot Levain for a warming fall breakfast. Make a batch of Dipping Chips to serve with Preserved Lemon and Fava Bean Hummus for an inspired snack. Wow brunch guests with a spread of Sourdough Whole-Grain Bagels, Lemony Herb Chevre, and Beet-Cured Gravlax. 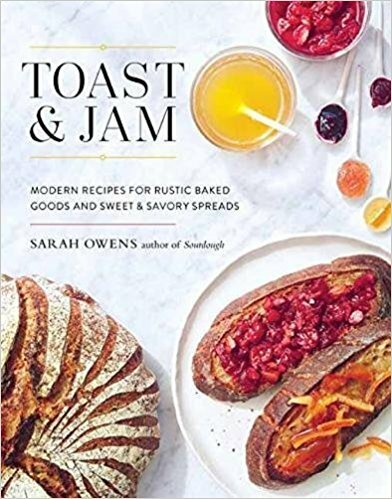 The recipes here offer a thoroughly fresh sensibility for the comfort found in a simple slice of toast spread with jam. 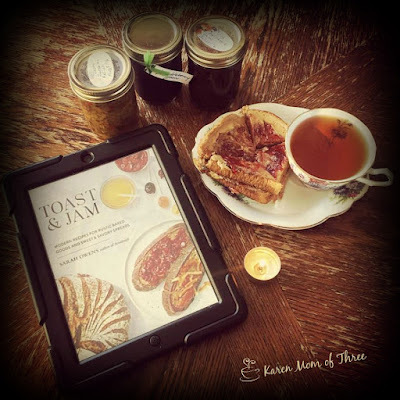 I can not wait to try these recipes and I hope you will join me in ordering and experimenting with these lovely recipes. On Amazon by clicking here. 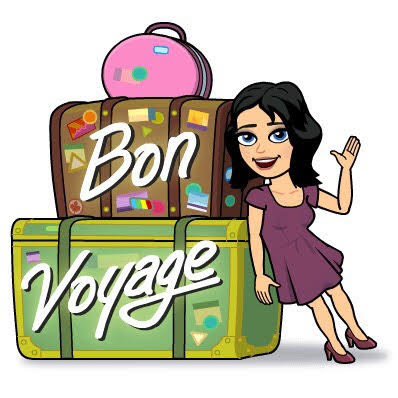 This is our second week and our theme is Destination Books. You know where the main character packs up and leaves their cozy town on a trip.... My selection for this weeks theme is a book from a series I love by Melanie O'Hara and her Traveling Tea Ladies Series. I first found out about this series from Tea Time Magazine and I ordered mine from The Book Depository one by one and loved each book in the series. My choice for today's destination read is Death In The Low Country. 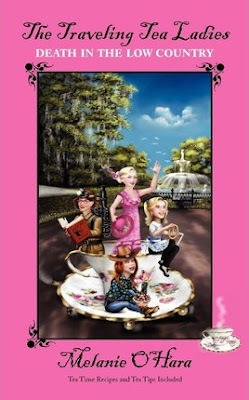 Former tea room owner, Amelia Spencer, and her fun-loving friends are known about their small town of Dogwood Cove, Tennessee as "The Traveling Tea Ladies" because everywhere their tea travels take them, murder and mayhem seem to follow. When the ladies participate in the Fancy Foods Show in Savannah, Georgia, they are soon confronted with an overbearing vendor, Dolly Jean, who insists she is the next Paula Deen. 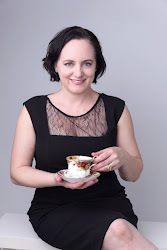 Dolly proves she will go to any lengths to steal the coveted blue ribbon award for best recipe even if she has to lie, steal, cheat and sleep her way to the the top including sabataging Amelia and Cassandra's cooking demonstration. When Dolly ends up murdered by her own low country recipe, the ladies know they've got to take action and find the killer or they may find themselves the next target! 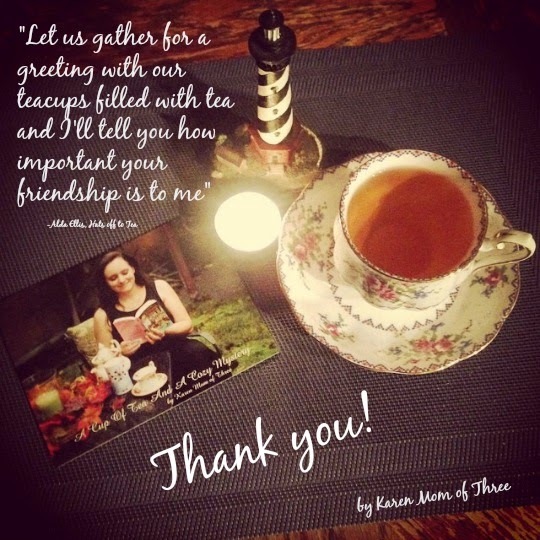 Strong women, strong tea and even stronger friendships are steeped in this mystery! 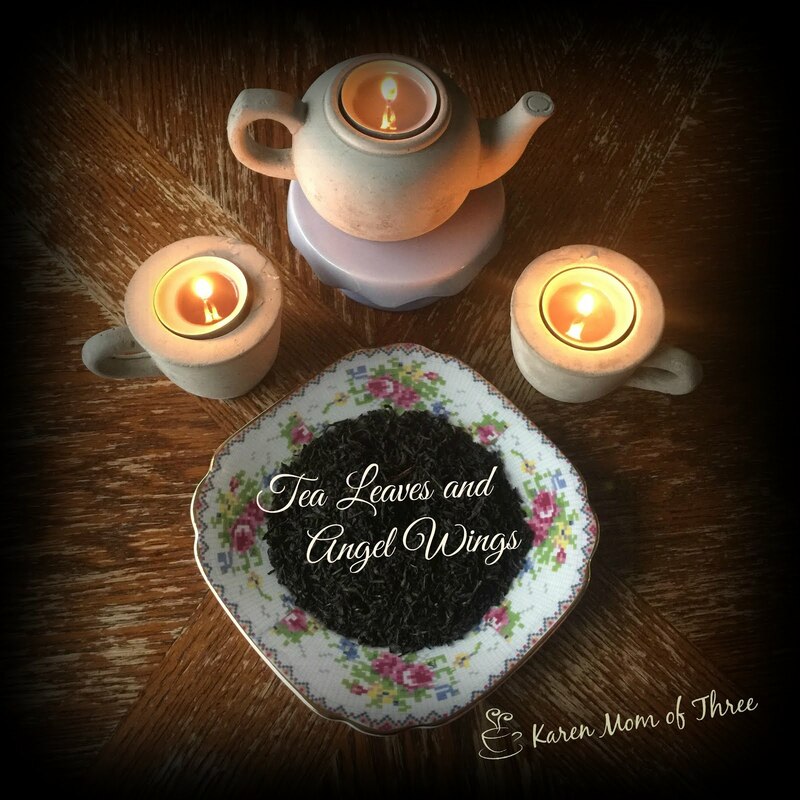 The Traveling Tea Ladies Death in the Low Country will leave you screaming for MORE! Tea-infused recipes and a resource guide of Savannah are included in this book. Click here to order your own copy from The Book Depository with free shipping worldwide. 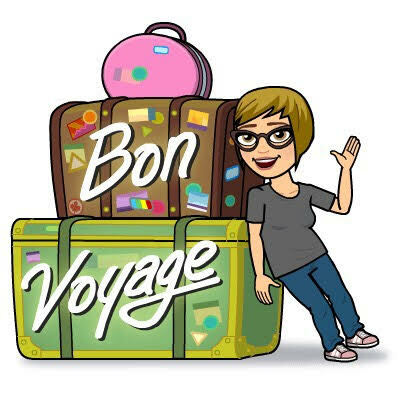 Don't forget to check out what Mary and Lisa's picks for this week are. Click here for Mary's Pick! 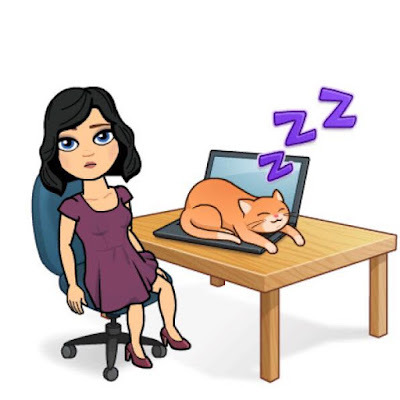 Please leave us each comments below and on each blog letting us know you are reading along with us, adding to your TBR pile or if you would like to share your own ideas for this weeks theme! We love hearing from you. 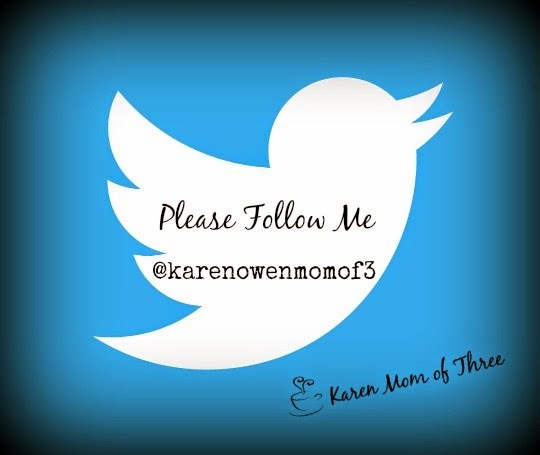 So please remember to comment and share! Thank you for joining me here for a cup of tea and a Three Amigos Summer Reading Club suggestion! 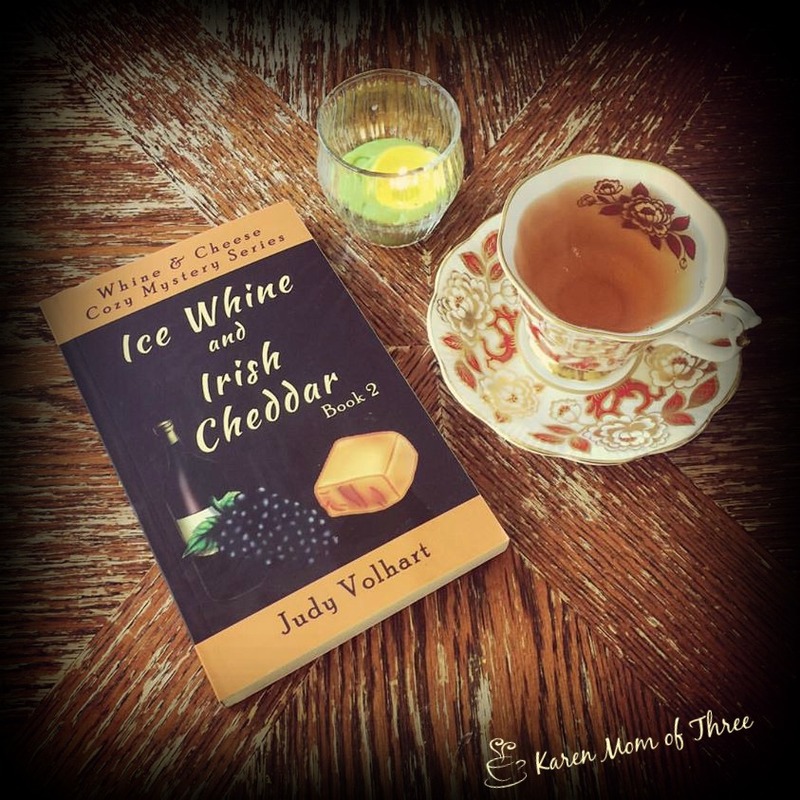 I was beyond delighted to have Ice Whine and Irish Cheddar, book two in the Whine & Cheese Cozy Mystery Series by Canadian Author Judy Volhart. 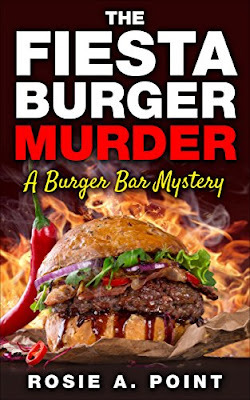 This is an interesting concept for a cozy mystery, the main character moves to a small town and opens a wine and cheese bistro. The menu features cheeses and wines with very cool tongue and cheek names names. 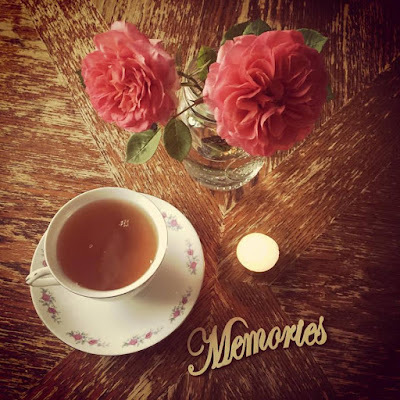 On top of a great menu, main character Amalia has her best friend working for her, a boyfriend she could at one time only dream about and another murder victim on the premises! I love this character, her very well meaning parents and I appreciate the Ontario Canada setting! While Ontario is towards the opposite side of where I live, I have visited Ontario and love the way Judy writes that makes it easy to see what it is like to live in Ontario in the winter. This mystery was not easy for me to figure out who did it and I loved the murder weapon in this story! You will have to read it to find out what I mean. Great cozy and fun to read in the sweltering heat of summer! Things were about to get as sticky as a pot of cheese fondue! Is Chloé dating a murderer? Who's stalking Nicole this time? Is the disturbed stranger from the woods friend or foe? And why in the world is 50+ year old Nora prancing about in push-up bras? Things get smellier than Blue Cheese when she learns that everyone loathed and feared him. The suspect list steadily grows. Amalia's eccentric Hungarian parents move just minutes away and despite her best efforts, soon learn of the murder. To her surprise, her father eventually gets involved. Meanwhile, things steam up with new boyfriend Matt, who continues to discourage her involvement in the case. Nora, on the other hand, is right in the thick of things- and gets steamy with Mr. Leonardo! (Gag). In her accidental detective style, Amalia blunders through, trying to solve the murder. Will she be sharp, like an aged Irish Cheddar, or crumble like an aged Asiago? 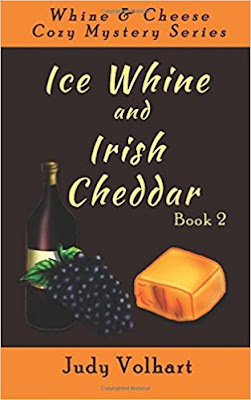 Ice Whine and Irish Cheddar is out now and you can find it on Amazon by clicking here. A very hot Saturday on the menu for today, one last week of school for the kids and the temperature is rising here. Summer arrived with full force this week and with it the need for summer reads. 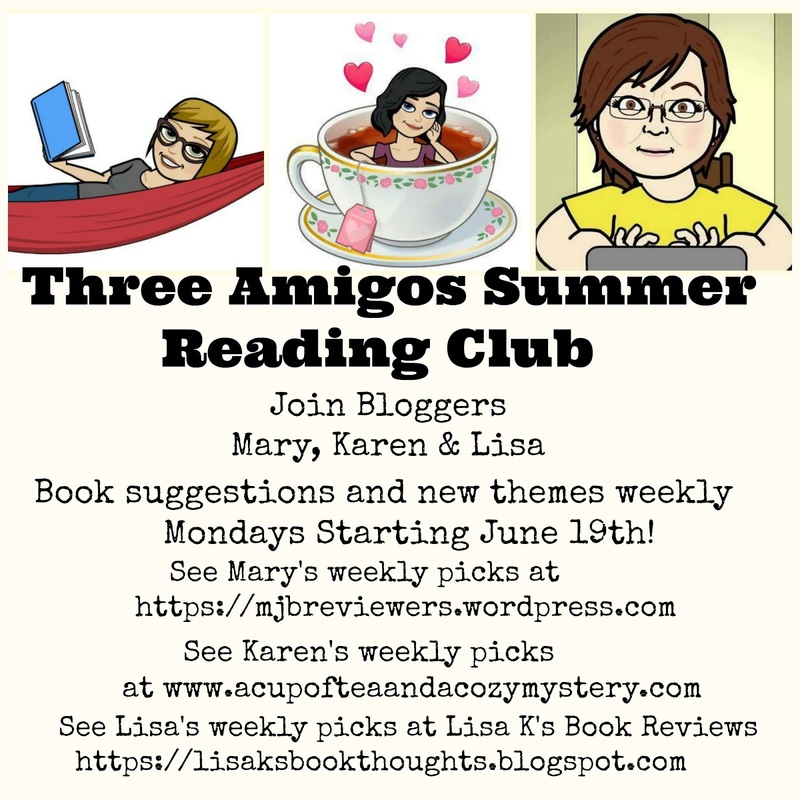 We started this week with our 11 week Three Amigos Summer Reading club, I hope you have enjoyed our first three summer suggestions and I can not wait for Monday to reveal the next ones! I was thrilled to receive Judy Volhart's Ice Whine and Irish Cheddar in the mail this week, I read it in one sitting and look forward to sharing my review with you tomorrow. 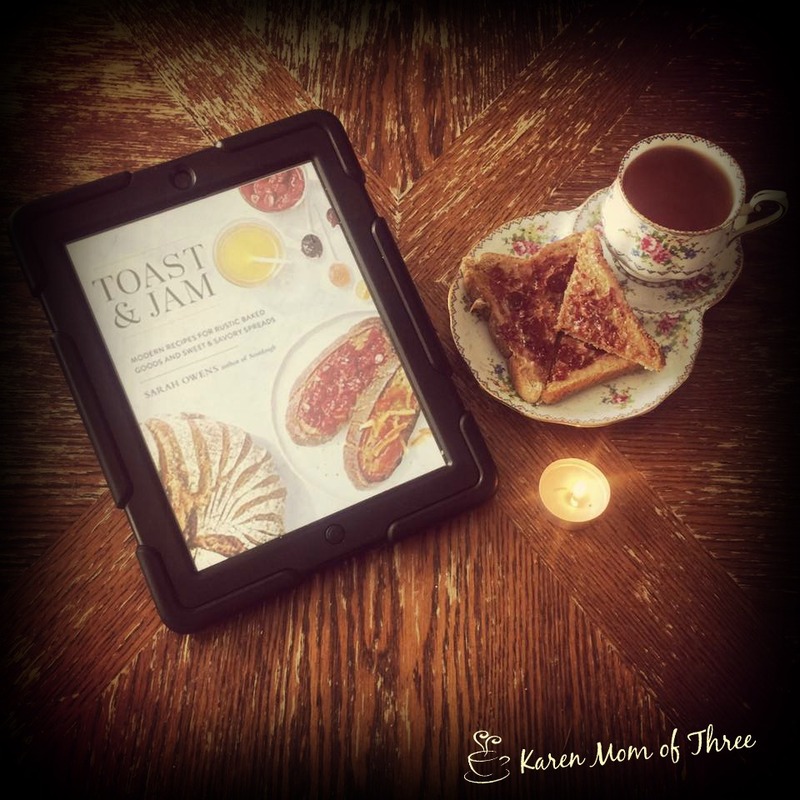 I enjoy toast and jam daily so when I was approved to review Toast & Jam I was very delighted! This book is out August 15th and if you have a foodie in the house this is a book you will need to own! Look for my review later this week. I had Killer Party on my table this week by Lynn Cahoon. This long running series gets more interesting with each book and I know you will enjoy this one for sure. Out July 18th now is the time to pre order this one! Another fun summer read and this one called The Fiesta Burger Murder is a first in series from author Rosie A. Point. While the cover doesn't give the cozy feeling, the book does for sure and the cover makes me hungry! This one is out July 4th and I think you will be pleasantly surprised with this story line and theme. 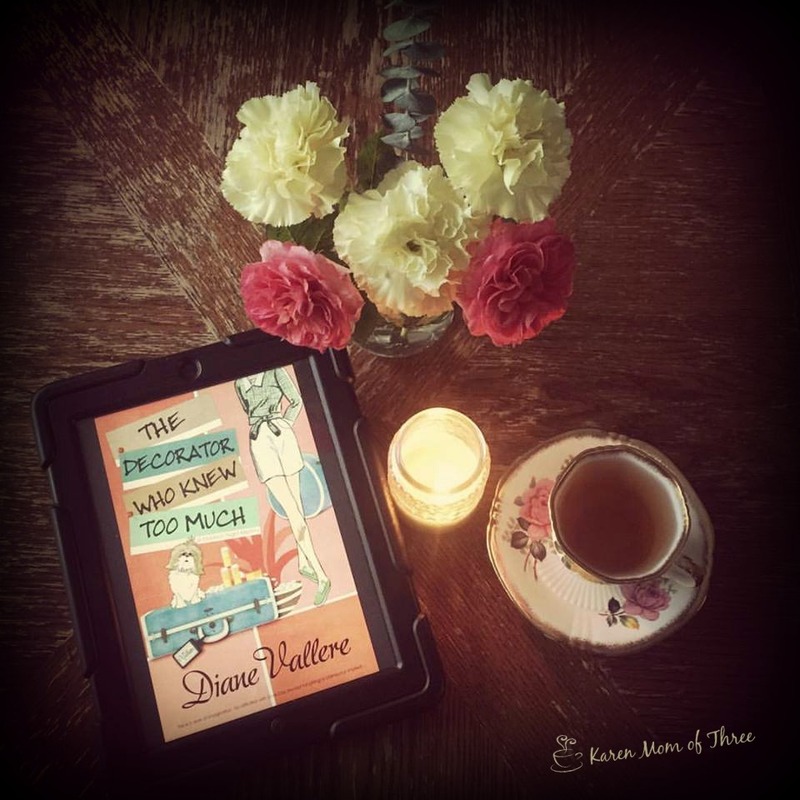 The Decorator Who Knew Too Much by Diane Vallere was a read I was not expecting to evoke such emotion in me! 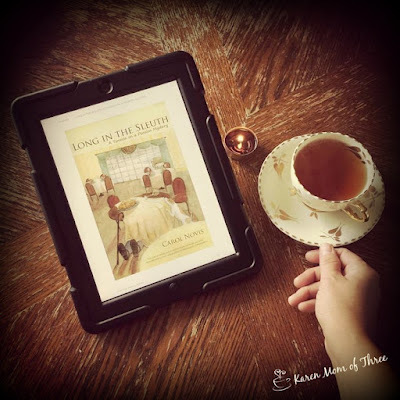 I enjoyed this delightful mystery and it was a new series for me. This one is out now and a great summer read for sure. 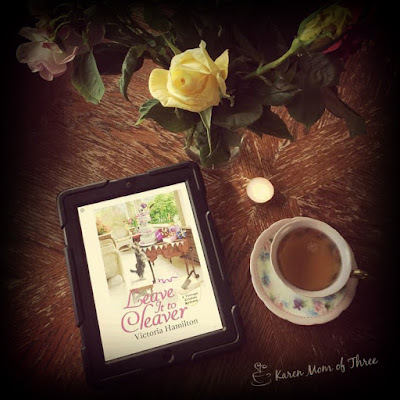 The cover is spot on with the series and I love that what you see is what you can expect from this fun vintage loving series. 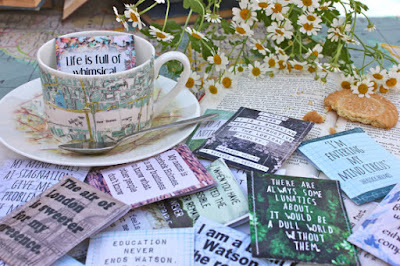 Welcome to Fancy Friday and as it is the first Friday of Summer I thought I would share some of my recent Etsy favorites. 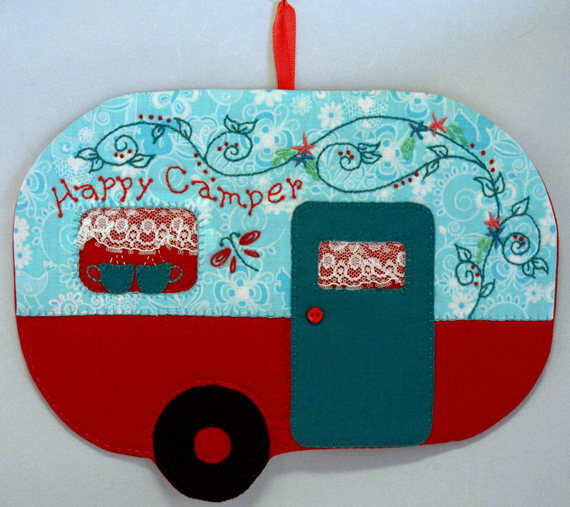 While I am not a camper myself, I would love a camper like this one to turn into a traveling tea oasis and this Mug Rug I found struck my fancy! 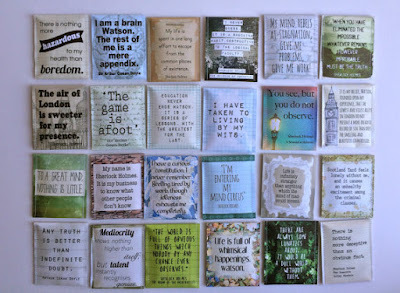 This is from QuiltinCats Etsy shop and is now on my Etsy favorites and Elfster list, I really would like this! Click here to see this shop and listing...oh and if you happen to have a small trailer you are not using send it my way and I would make good use of it! keeping with the whole vintage glamping theme, I found these beauties! 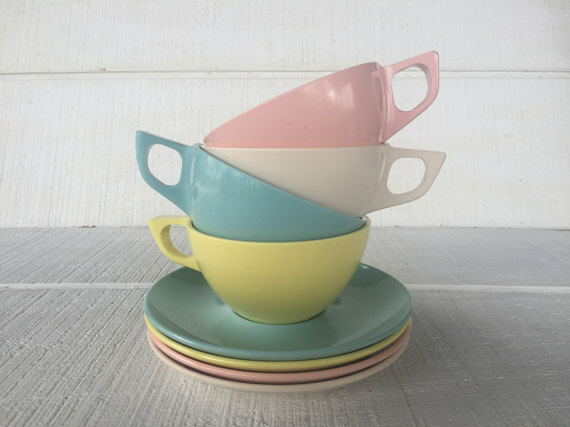 In 1350 North Vintage Etsy shop these 1950 stunners would be a fun addition to my tea parties don't you think? 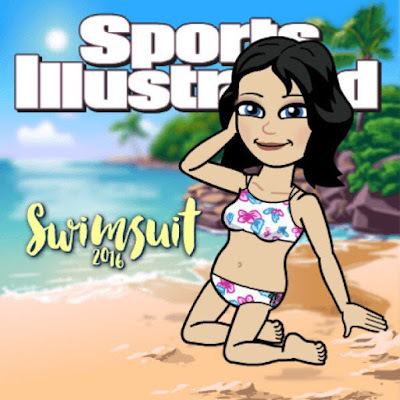 Click here to see these beauties and more! If I had a trailer I would also have this Tea banner, actually I might get the tea banner anyway! 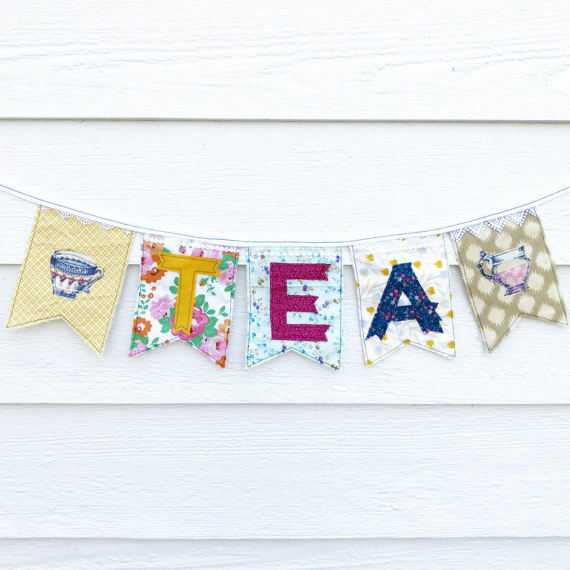 This banner caught my eye in the Tunes and Spoon's Etsy Shop. Seriously love this idea! 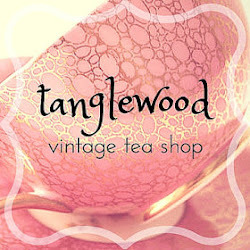 Click here for this fun shop and listing. It feels like just yesterday I read A Grave Prediction by Victoria Laurie, I read it when it came out in hardback last year and am so excited it is out in paperback. This is a Psychic Eye Mystery, number 14 and yes I have read them all! 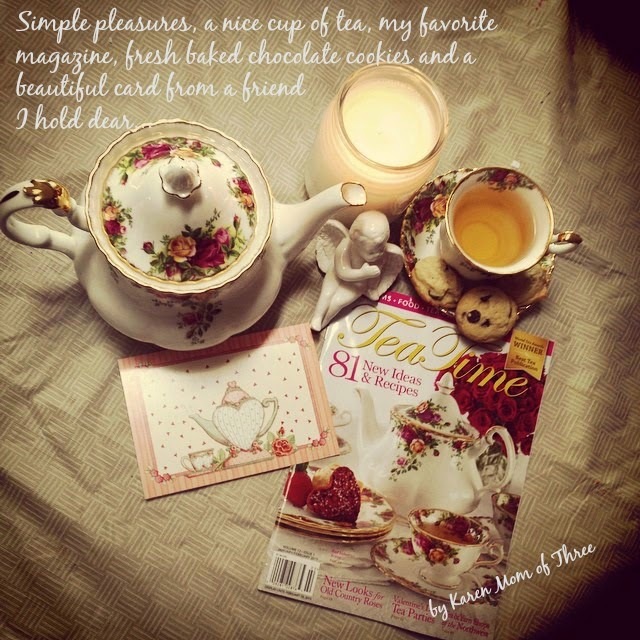 You can read my review from last year by clicking here. Victoria Laurie is an author that I first fell in love with at my local library. Spinning the racks one of her books literally jumped from the rack and into my hands. True story that is how I used to pick my books, let the kids get their books in the kid section which was beside the cozies and as they spent their three minutes looking, I would spin the rack and what fell came home....try it sometime it is a fun way of discovering new series. In A Grave Prediction, main character Abby is hired to help train FBI members in LA, you can imagine the lack of welcome she receives! However this is an action packed and exciting read with every bit of magic Victoria Laurie has created to captivate the readers since book one! 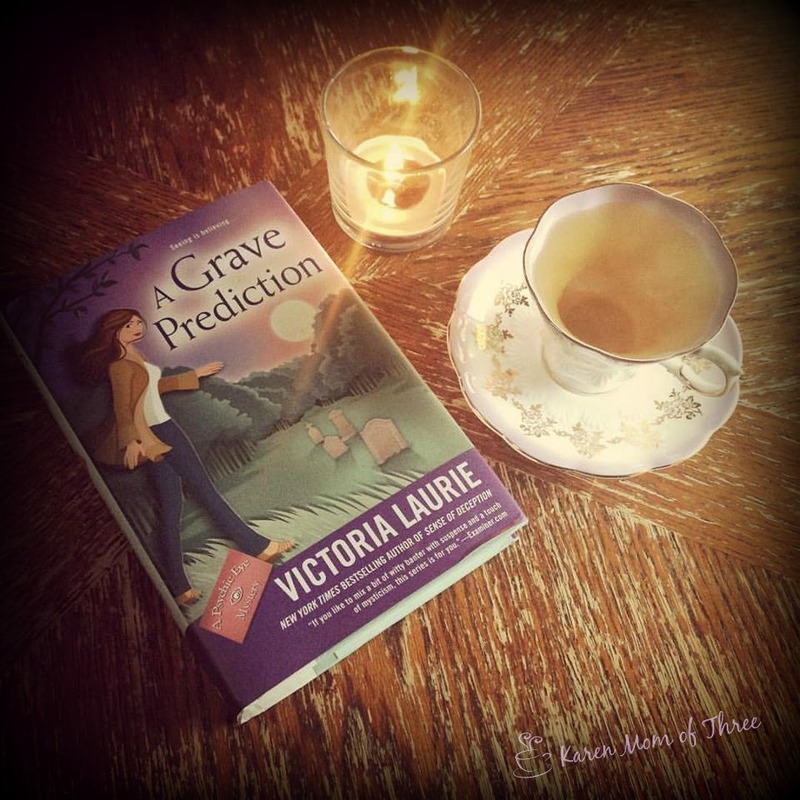 "In Victoria Laurie s new Psychic Eye mystery, Abby Cooper learns that following the money often leads to murder . . . Professional psychics learn to deal with skeptics, but Abby has to prepare herself for one steep uphill battle when she s sent to San Diego to help train FBI officers to use their intuition. Her first challenge: a series of bank robberies in which the thieves made off with loads of cash but left no clues. Abby s sixth sense leads her team to a tract of land recently cleared for development. But instead of finding clues to the cash, Abby gets a vision of four buried bodies. A site search turns up some bones and pottery from an American Indian tribe, but that s still enough to delay construction for years. With a furious developer and dubious FBI agents on her back, Abby is losing credibility fast. But unlike the best laid plans, Abby s talent rarely leads her astray. And if the bodies aren t there yet, that means that four deaths can still be stopped. She ll just have to dig a little deeper . 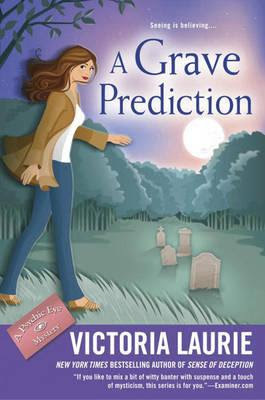 . ."
A Grave Prediction is out now and you can find it on Amazon by clicking here. 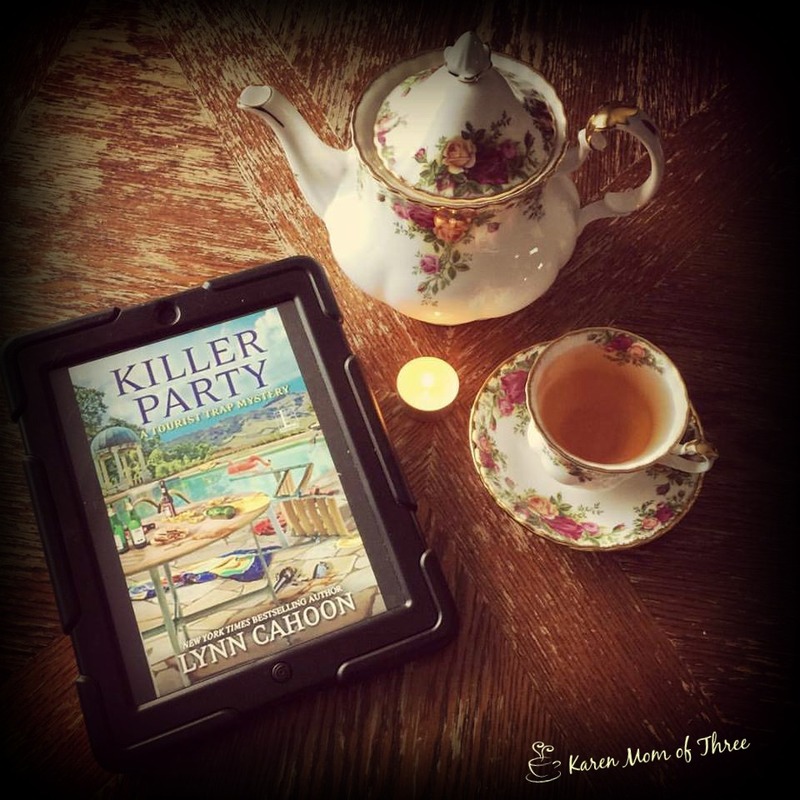 Late last night I finished Killer Party by Lynn Cahoon. This long running series is a favorite of mine and this one did not disappoint. Great friction, mystery and compelling relationships in this cozy mystery. I loved the setting, a grand Castle and the idea of the hotel attached to it and in it. Easy to picture the setting and I liked the way Lynn wrote about her character's relationships and town happenings. This town gets more interesting by the book! This one is a great addition and it is out July 18th. 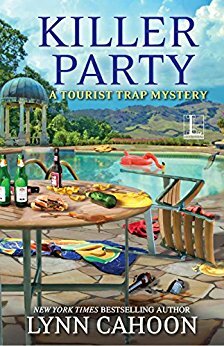 For a gang of old college buddies, the quaint resort town of South Cove, California, is the perfect spot for a no-holds-barred bachelor party. 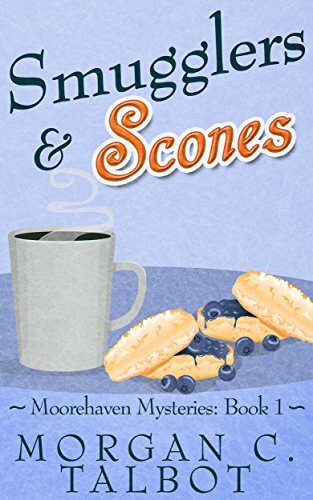 But for Jill Gardner—owner of Coffee, Books and More—this stag party is going to be murder . . .After a few months of living with her boyfriend Greg, Jill is still getting used to sharing such close quarters, but she’s got no hesitation about joining him for a weekend at South Cove’s most luxurious resort. While Greg and his college pals celebrate their buddy’s upcoming wedding, Jill intends to pamper herself in style. 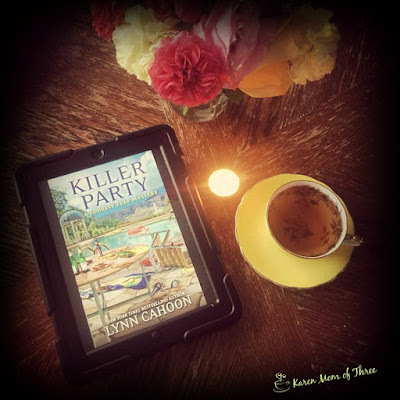 But when the groom is found floating facedown in the pool, Jill must find the killer fast, or she might not have a boyfriend to come home to any more . . . Learn more about Lynn and her amazing series by clicking here. Father's day I read a first in series by Rosie A. 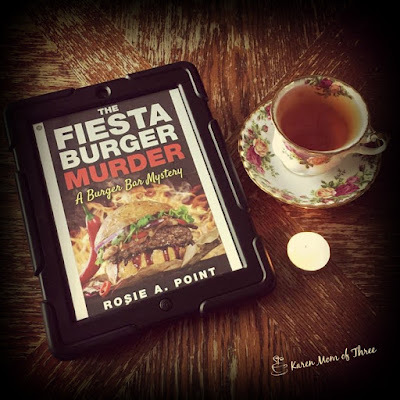 Point called The Fiesta Burger Murder. This book was sent to me for review and is out on July 4th. While the cover doesn't scream cozy mystery it does look darn good and was a very good mystery. Christie Watson is the main character, impulsive, inquizitive and on sabbatical from her job as a police officer in Boston. Coming home to her best friend's house after years of being away and under duress, this break is not at all what she is looking forward to but is exactly what she needs. I think this will be a very good series and one to watch for! Boston Homicide Detective, Christie Watson, wants nothing less than to bury her head in the sand in her hometown, Sleepy Creek, Ohio. 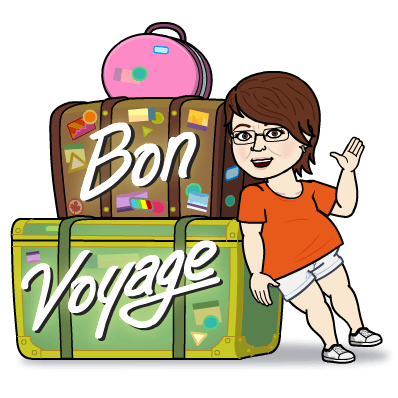 Placed on sabbatical for a little ‘over-enthusiasm,’ Chris has to stay out of trouble or risk losing her job for good, and Sleepy Creek, with its clapboard homes and peaceful milieu, seems just the place to do that. But returning to Sleepy Creek means facing the one cold case she’s never solved: her mother’s murder. The past becomes the least of her worries, however, when a man is murdered in her best friend’s back yard. Griselda, awesome human being all-round and owner of the local Burger Bar – serving scrumptious delights like the Mexican Fiesta Burger – is the prime suspect. To make matters worse, the handsome detective in charge of the case won’t quit asking questions or drop the icy professionalism whenever Chris counters with her own. Det. Watson can’t let this one slide – sabbatical or not, she won’t let her friend wind up behind bars for a crime she didn’t commit. Equipped with her cop skills, and that thirst for truth, she sets off to solve the murder before it’s too late. This book is ready for preorder on Amazon.com by clicking here. 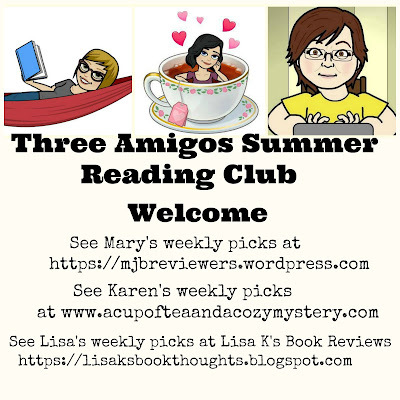 Welcome to the First of our 11 week Three Amigos Summer Reading Club! 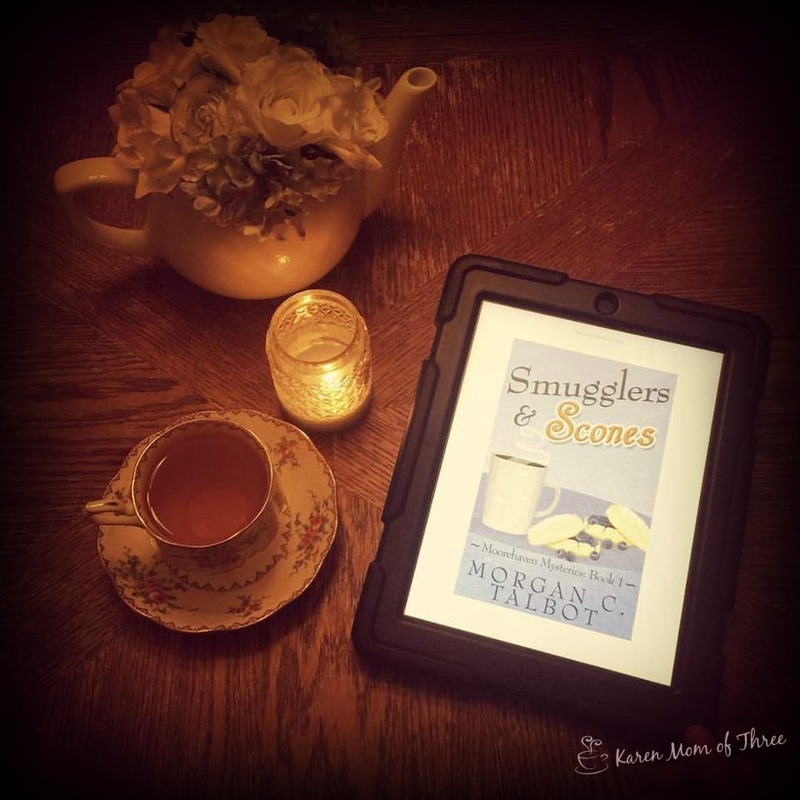 Today our theme book is "Books By The Beach" and my suggested selection is Morgan C. Talbot's Smugglers & Scones! 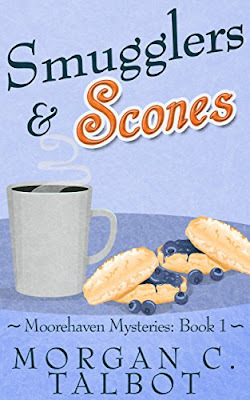 This is a new cozy mystery that I read and reviewed in January and it is one that I loved so much, I could not put it down. This is a great vacation read and will give you all the cozy feels! 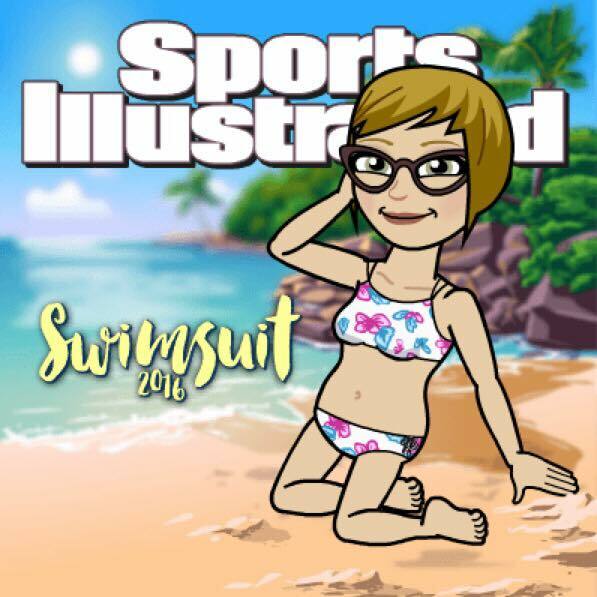 I hope you will check out my review by clicking here. Pippa Worthy runs Moorehaven, the Oregon Coast’s quirkiest bed-and-breakfast and former home of world-famous mystery writer A. Raymond Moore. Guests come there to write their own crime novels. When a real-life murder takes a local’s life and washes a handsome boat pilot into her arms, Pippa is yanked into a deadly plot of her own. 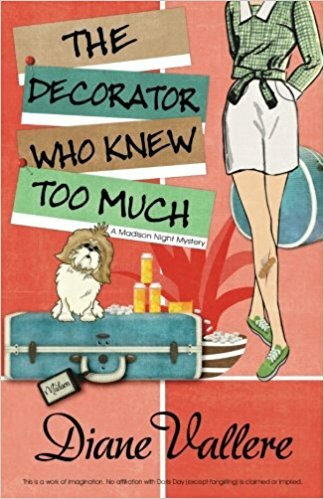 A tangle of secrets crashes past into present, and Pippa must uncover clues dating back to Seacrest’s Prohibition days, including a secret Moore himself hid from the world.Juggling her book-writing guests, small-town intrigues, secret club agendas, and a possibly fatal attraction, Pippa must sort fact from fiction to know who to trust before a desperate killer claims a final revenge nearly a century in the making. You can find a copy of your own on Amazon.com by clicking here. We hope you will leave us each a comment and let us know where you are joining us from, and let us know how your summer reading is going! I would like to apologize to author Diane Vallere and her assistant Liz for not having had this read before now, it was sent to me in February to review. Unfortunately I put it in my read file, not my TBR file and it got overlooked. I spent the last two days reading this wonderful book and I am truly sorry it took me so long to get it read. I did not notice this error on my own and thank Liz for being on top of things! While I am sorry it took so long to read I have to say I am thrilled with the fact that the flowers from my neighbor's garden work perfectly with the cover. The Decorator Who Knew Too Much can be found on Amazon by clicking here. 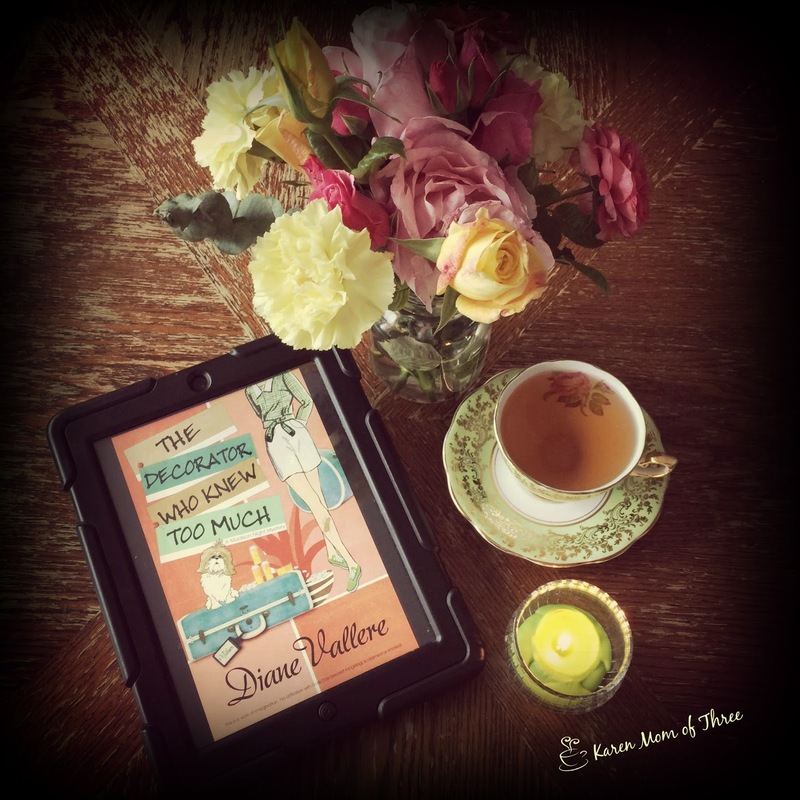 Learn more about Diane Vallere on her author website by clicking here. I can not believe that it is Saturday already, honestly this is a stupid statement, I know what day it is, I just feel like the week between these posts speeds by and yet Monday-Thursday feel like they take an eternity, but here we are. 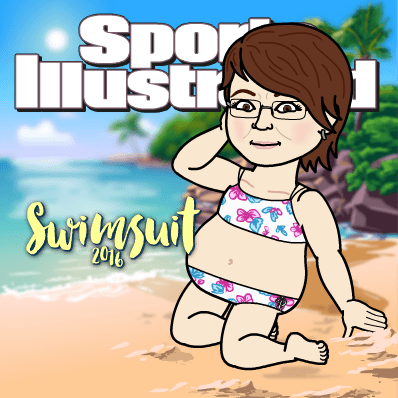 I am off to a special needs baseball tournament shortly, an event I have come to love and look forward too more and more with each passing year. I have made some incredible friends on the field, parents who like me have a different path to follow then our typical peers. I don't know what I would do without the support of our Canucks Autism Network community or our Challenger Baseball Families either. They have helped to shape a better then normal childhood for my boys and our community. This week I did a few trips to the local charity/thrift stores and even one slightly further trip to Value Village, where I picked up this lovely book I had been eyeing on line. 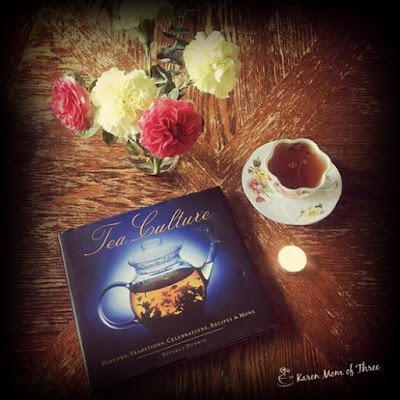 It is called Tea Culture and I am very much looking forward to soaking in all it has to offer me with in these beautiful pages, more on this $5.99 deal in a later post. I was thrilled with the buy 4 get one free deal at another thrift store I went to. 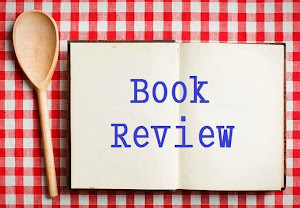 I was thrilled to find Well Read then Dead by Terrie Farley Moran, I lent my copy out and can not remember who I lent it to. I also got a few I had been wanting to read and one I had never heard of. Not bad finds at all. 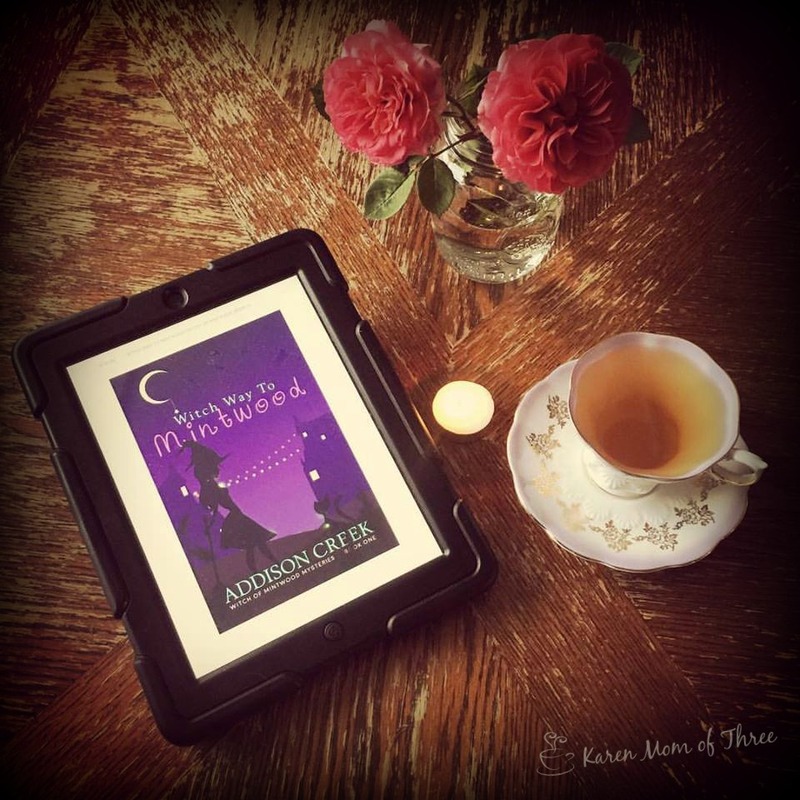 I am reading I think my 92 book of the year right now, and Witch Way To Mintwood was a really great suggestion by my friend Lisa and on Wednesday I really needed a paranormal cozy read the way my mother needed Calgon to take her away in the 70's. This was a great book and I am very much wanting to read the series. If you like me love Witch Cozy Mysteries do pick this one up. For me Leave it to Cleaver by Victoria Hamilton was a first in series for me, this is I think book 5 and a lovely bitter sweet cozy. I picked up two more in the series this week for my TBR pile and am looking forward to give them a go. I am very excited that my friends Mary and Lisa K are going to help me promote summer reading with our Three Amigos Summer Reading Club. We hope you will join us on Mondays all throughout the summer and see our 33 picks! 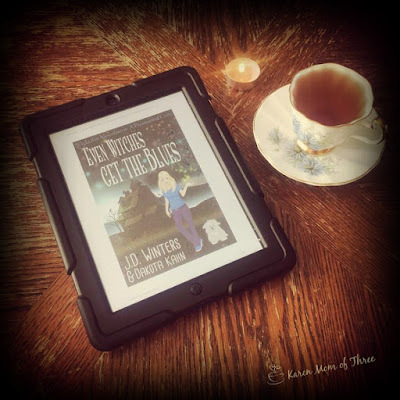 11 weeks, 33 books, endless possibilities for your TBR pile and arm chair adventures. 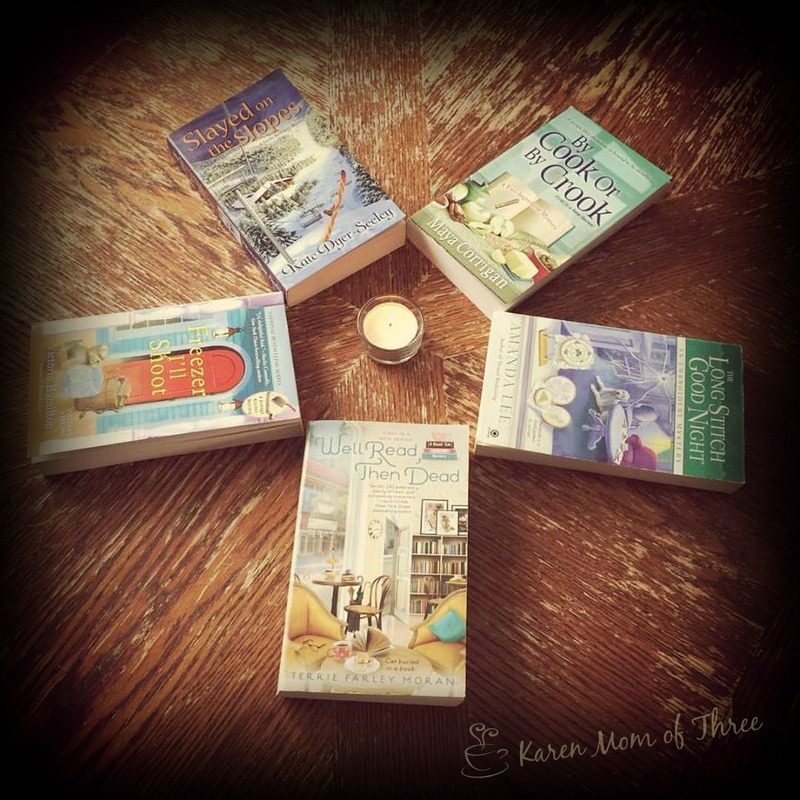 We hope you find your perfect summer read with us! Sunday my family and I took a walk for the JDRF with a fundraising walk around Vancouver's Stanley Park, even though I am on Crutches I did walk the entire thing, which is likely why I am back on crutches, but it was worth it. I also brought the book I was reading, A Ghostly Light by Juliet Blackwell. 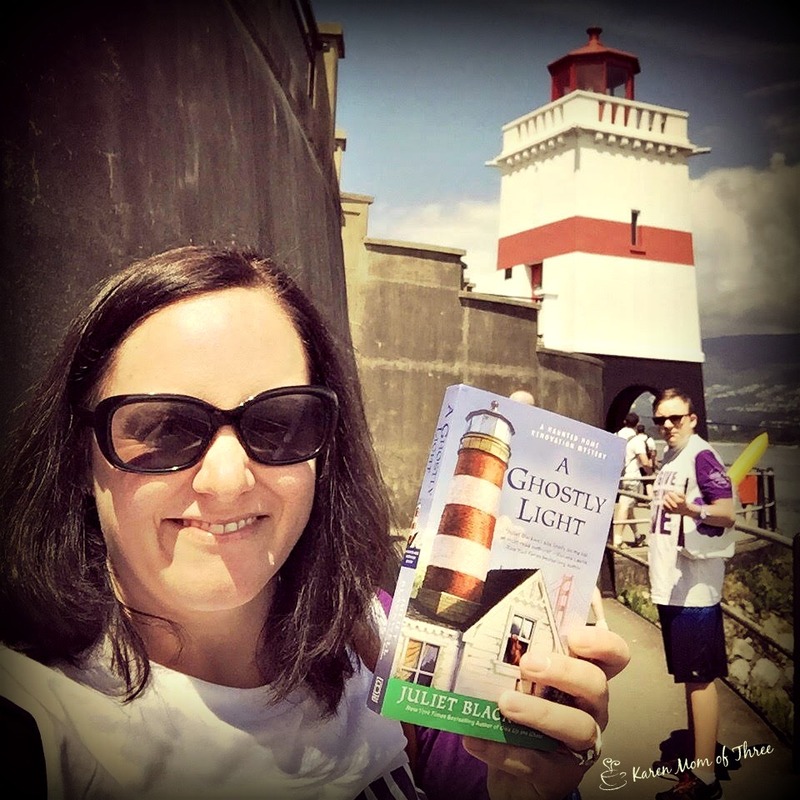 This book is SO GOOD, if you love lighthouses, like I do, great characters and settings as well as a good ghost mystery this is a book for you! Loved it, you should order it! Long In The Sleuth by Carol Novis was a refreshing and entertaining cozy where I learn a lot about Jewish culture and had a fantastic time with some funny characters and surprising twists! This week also marks the second anniversary of the passing of a very special young lady. An extraordinary set of circumstances lead me to come to know and champion a young lady facing insurmountable odds. In memory of that precious child and her courageous fight with cancer, I set my table. In support of her mother, family, friends and survivors, I lifted my cup in remembrance. If you feel moved, have the ability to donate too or help families like my friend Ahmie I encourage you to do so. Special prayers to the families just like hers who fight just as hard along side them. #noonefightsalone #teawithahmie #noonegrivesalone .